A neat and tidy instrumental debut for Audio Damage, Tattoo has a solid sound and a deceptively powerful feature set. Easy-to-use, enjoyable interface. Powerful sounds. Stable and CPU-friendly. Versatile without being overwhelming. Innovative syncing options. Can't load your own samples. Swing function isn't the funkiest. No undo feature. The launch of Tattoo, Audio Damage's first software instrument, follows a year or so that's seen the company release a steady stream of altogether more sensible plug-ins. At one time, it was the purveyor of mad-as-a-March-hare concepts that did strange, wild and wonderful things to innocent signals. But growing up is a part of life and, more recently, AD has ably tackled studio staples like reverb and compression with Eos and Rough Rider Pro. Now we have Tattoo, which is a synthesising drum machine with step sequencing thrown in. Tattoo offers up 12 synthesised drum sounds, and all the usual suspects are included: kick, two snares, three toms, closed and open hi-hat, cymbal, rimshot, clap and cowbell. Each has a variety of appropriate editing parameters - for instance, the kick has everything from Saturation and Envelope to Tune and Clock Level, while the clap has just Tone and Reverb (not actually reverb per se, but a decaying noise to give the illusion of such). Some sounds have two envelope controls for manipulating, say, the volume and pitch independently. We spent a lot of time playing with the synthesis parameters on offer, and they are very well set up. They really reward experimentation and you don't often find yourself hankering for more control than is on offer. Naturally, this doesn't afford the broadest sound palette in the world, but that's not the idea. This plug-in harks back to a simpler time, when entire beats were constructed on one machine - an 80s approach that has seen a huge resurgence in almost every strata of current pop music. Sequencing is handled by a programming grid with up to 32 steps - you simply click on the blocks to pencil in where you'd like each drum hit to fall. 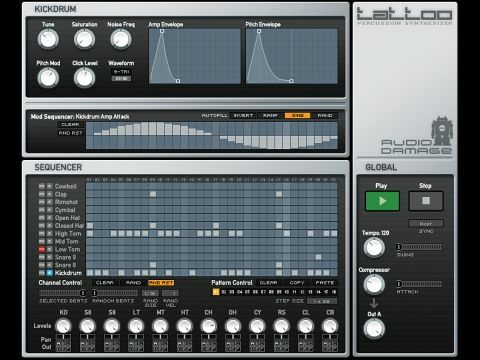 You can sync it to your sequencer in a number of ways and the timing is rock solid. 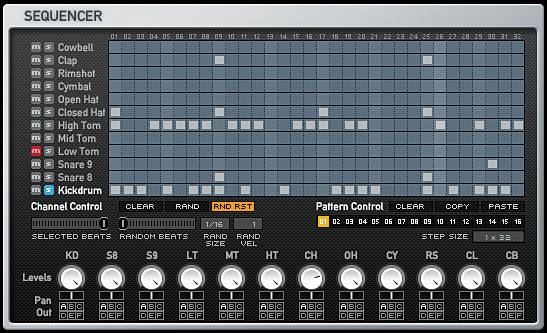 Tattoo's step sequencer isn't just about programming beats, though, as demonstrated by the Selected Beats and Random Beats sliders. The former affects your programmed beats: at the default maximum setting, all hits are played, but reduce it and some beats will be skipped at random. Random Beats adds hits at random, and you can set the grid so that they only appear on, say, quarter-notes, eighth-note triplets and so on. Note that both of these settings are per drum, rather than being applied to the entire pattern. We'd hesitate to use this feature live, but it's certainly great for creating ideas and variations, whether by using keen ears to recreate some of the tastiest results, or by simply bouncing a long section and using the highlights. Simpler rhythm randomisation can be had with the Rand button - press it and the pattern for the selected instrument is scrambled. As for the patterns themselves, Tattoo can have up to 16 loaded at a time, which should be plenty for most users (and you can always use multiple instances if it isn't). Finally, the Step Size setting does exactly what it says on the tin, offering pattern lengths in a variety of step-lengths and relative Step-Value settings, including 1/32, 2x1/16, 1/16T, 1/16 and 1/8T. In common with its hardware ancestors, Tattoo offers multiple outs and basic mixing, so you can set the level and panning for each drum, and easily route them to any one of six outputs, labelled A to F. Output A sports a rather handy compressor, too - it has just one dial and one slider, but it's a great way to add punch and weight. It's found in the Global section, which also offers swing control, transport buttons and syncing options. The remaining section, the Mod Sequencer, enables you to create sequences for just about every parameter on offer. Simply choose a drum to open its editing parameters, then as you click on each parameter control in turn, you'll be confronted with its modulation lane. The height of each step represents an offset for the given parameter rather than an absolute value. If you don't feel like drawing in your own modulation sequences, you can apply a number of preset shapes and random variations at the push of a button. It would be nice to be able to use our own drum sounds in Tattoo, but this does somewhat miss the point of a standalone drum synth and sequencer. It's also too easy to accidentally ruin patterns, especially when first starting out, and with no undo function, there's not much you can do about it. A comprehensive, multi-level undo facility would be a great addition for an update. Oh, and the editing grid is on the small and fiddly side, although not prohibitively so. We have to say that we don't rate Tattoo's swing function. Supposedly modelled on that of the TR-909, the groove just didn't sound very good when applied to patterns we created. That said, you can apply your own groove by triggering the step playback using MIDI notes: C5 plays the next note, B5 goes back a note and D5 resets the sequence. This is a neat feature indeed, and not without some considerable amount of creative potential, too, for those who want to abuse it. At first, Tattoo left us underwhelmed. It seemed cute and fun, but it appeared to lack that special spark and innovation that sets Audio Damage apart. But after reading the manual and spending a little more time with it, we realised what a cleverly crafted little powerhouse it actually is. AD's forward-thinking approach is exemplified in the random beats functionality and MIDI note sync method, the latter of which neatly sidesteps any issues one might have with the built-in swing function. And the ability to send out MIDI data is a sensible inclusion because, while Tattoo's sounds are pretty powerful, they're not a one-stop shop. Slow burner or not, Tattoo is a rather excellent plug-in, and well worth a look for anybody who employs electronic drums. It is slightly more expensive than the regular plug-ins in the Audio Damage range, but it's by no means a bank-breaker. Let's hope this is the first of many instruments from AD.